Mount Rokatenda in East Nusa Tenggara province erupted early Saturday morning, and nearly 3,000 people have been evacuated from the area on Palue island. Click below to watch the eruption! 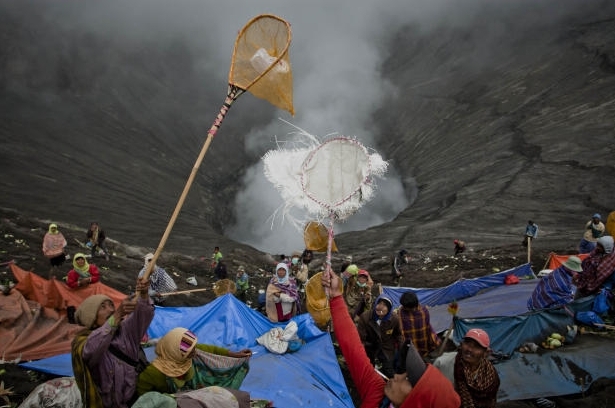 From the Yadnya Kasada Festival at the crater of Mount Bromo, July 23, 2013. The festival began in the 15th century when a princess named Roro Anteng started the principality of Tengger with her husband, Joko Seger. The childless couple asked the mountain gods for help in bearing children and, according to the legend, the gods granted them 24 children on the provision that the 25th must be tossed into the volcano as a sacrifice. The 25th child, Kesuma, was finally sacrificed in this way and the tradition of throwing sacrifices into the volcano to appease the mountain gods continues today. Mount Bromo is an active volcano and part of the Tengger massif, in East Java, Indonesia. To see more photographs from the festival, check out this feature story on CBS! I came across this article today from Wired and just had to pass it along…! Corium… Nuclear Meltdown lava. And, I’d like to point out the lovely margin lobation! Love is universal and attraction often fate and gravity. Think about the piano differently. Better in headphones! Image Credits: Hubble Space Telescope / NASA / The GigaGalaxy Zoom Project / etc. Music available on iTunes/Amazon/ CDBaby /etc. You have always been here. Bonus points for naming the planet at the end! enter for a chance to win some limited edition NASA art prints! “Disaster Zone”, a natural hazards educational resource. Dr. Tom Pfeiffer, volcanologist with VolcanoDiscovery (an adventure & study travel group that gives tours of active volcanoes) , just posted some amazing photographs from their recent expedition to Batu Tara volcano to observe the ongoing strombolian activity from close range. Really spectacular stuff! You can view his entire set of photographs and information here. Can Volcanoes Form Just Anywhere? Eldfell (“fire mountain” in Icelandic) is a volcano on the island of Heimaey in the Vestmannaeyjar archipelago 15 miles (25 km) south of Iceland. Photograph by the late Svienn Eirikksen, fire marshal of the town of Vestmannaeyjar. The origin of the magma for hot spots is not well known. We do know that the magma comes from partial melting within the upper mantle, probably from depths not too much greater than 100 km. The actual source of the heat that causes the partial melting (the actual hotspot itself) is almost certainly much deeper than that, but we really don’t know how deep or even exactly what a hotspot is! At a divergent margin, two tectonic plates are moving apart, and magma that is generated in the upper mantle flows upward to fill in the space. This magma is probably generated at depths that are shallower than those for hotspot magmas. People argue about whether the magma forcing its way to the surface causes the plates to move apart or whether the plates move apart and the magma just reacts to that and fills in the space. Perhaps it is a combination of these two. The most extensive example of this type of volcanism is the system of mid-ocean ridges. Continental examples include the East African Rift, the West Antarctic Rift, and the Basin and Range Province in the southwestern US. The final major place where volcanism originates is at convergent margins (subduction zones) — where an oceanic plate dives under either another oceanic plate or perhaps a continental plate. 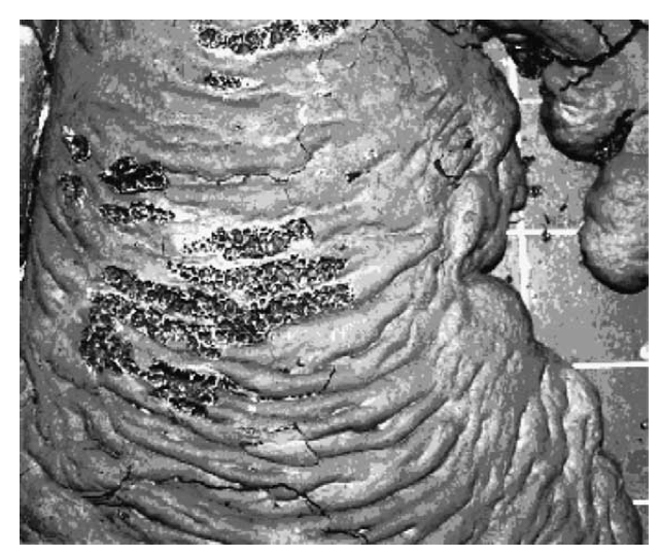 As the plate gets pushed further and further it starts to give off its volatiles (mostly water), and these migrate upwards into the mantle just under the overriding plate. The addition of these volatiles to this overriding mantle probably lowers the melting point of that mantle so that magma is generated. Part of the magma may also be generated by the downgoing plate actually starting to melt as it gets into the hotter and hotter interior. VW has more information on the topic here!